Peanut exercise balls and horses. We introduced these two new tools to Claire’s rehabilitation program this week. Both provided some great results. Claire’s therapists at OCH Grapevine brought out a peanut exercise ball yesterday to let Claire practice lifting her head. Claire has been working hard to lift her head at home and we’ve seen her do it several times; but there is something different when the doctors and therapists see her do it as well. They got to see her lift her head yesterday. Claire stretched out over the exercise ball and when asked to raise her head, she did. 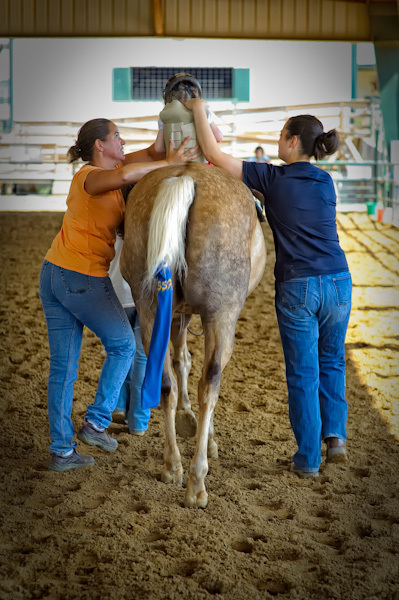 Her therapists could feel the effort in her upper back muscles: she was working very hard. Her hard work extended into today’s new experience. We arrived at Bridlewood Farms in Flower Mound at 10:15 AM for Claire’s 10:45 appointment. We met Mandy, Melissa, Reyna, Toni and Kathy (forgive me if the spelling is incorrect). We also met Delilah, the mare Claire would ride today. She was gentle and calm. Claire had short outbursts, but the majority of the time she was attentive to what was going on around her. 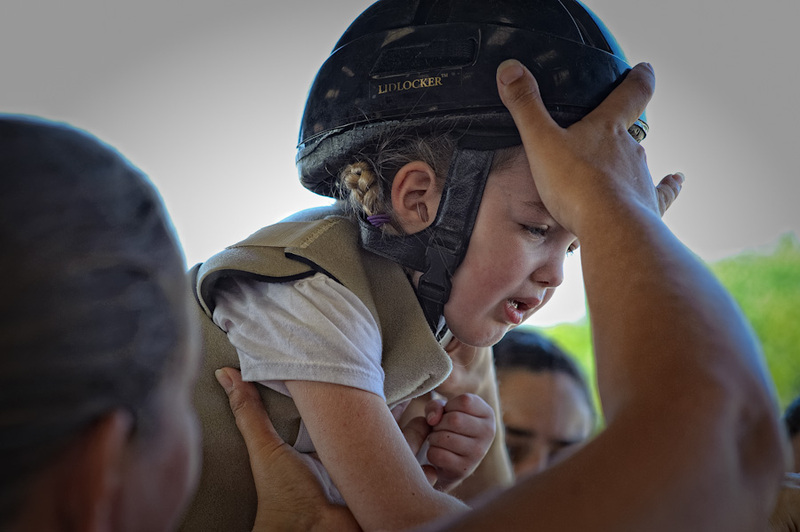 She struggled under the added weight to her head because of the helmet: her head would fall forward and the helmet would follow suit, covering her eyes. Each time we’d adjust the helmet, Claire would strain her eyes to see what was on her head. It made us smile. Claire’s trunk control and posture improved as we progressed through the session. We loved watching Claire observe and process the new stimuli. At the end of the session, Claire gave Delilah a small hug with Mandy and Tiffany’s help. Claire spent the ride home calm and collected, just processing the day’s events. We are excited for the outcome so far and look forward to next week’s session. Autumn and Heidi’s first week of school concluded on an upward slope. Heidi was skeptical after her first day, but improved her outlook on school by today. We’ll continue to challenge her and help her set small goals for each day to accomplish. I wanted to clarify my last post as well. Claire’s new therapy schedule which is one day a week instead of three is not indicative of progress. We voluntarily changed the number of sessions because we felt the time we were spending in the care traveling to therapy was time that would be better allocated toward therapy at home. Claire continues to improve, however, the reduced outpatient therapy schedule is not a function of improvement. We also have not learned the results of the MRI and we have not decided whether we will solicit those results. If we do, we will be sure to share them. Thank you as always for your prayers and support. I will continue to post on an every-other day basis for the foreseeable future. Enjoy your weekend! An awesome day for Claire!!! Love seeing the progress that Claire is making. I pray that you can see all your hard and efforts in every small step Claire makes. How amazing to see Claire on a horse. She looks so cute!!!! Glad to hear that Autumn and Heidi had a sucessful week at school. Did they get a chance to see Claire on the horse as well? Or were they in school at the time of therapy? So thrilled to see Claire on a horse!!!! May God continue to work miracles in her life! They were at school unfortunately, but we hope to get them a chance to come sometime. Claire is a beutiful girl and her tender-heartedness was portrayed beautifully in these pictures. Praying for her still, so proud of all of you through this very emotional and physically draining time in your lives. What great pictures! Especially loved her looking up at the helmet, and the hug! So glad it went well. Next week should be even better, as she gets used to Delilah’s scent and the feeling of being on that big broad safe back. You can just tell how careful Delilah and the caregivers are with her. Glad Heidi’s week at school improved, and I pray small goals will keep her on that track. Every other day sounds like a good rhythm for now, enough to keep us informed and knowing what to pray for, and not too much to be a burden to you. What a good idea! She will grow up to love horses I bet. I am glad Heidi is adjusting to kindergarten, that is too sweet. All the little ones are growing up. Love you all! What a sweet little girl. Loved seeing the photos of her on the horse today. I hope someday to meet this sweet little Claire of yours and give her a great big hug. We continue to pray for Baby Claire and the whole family. 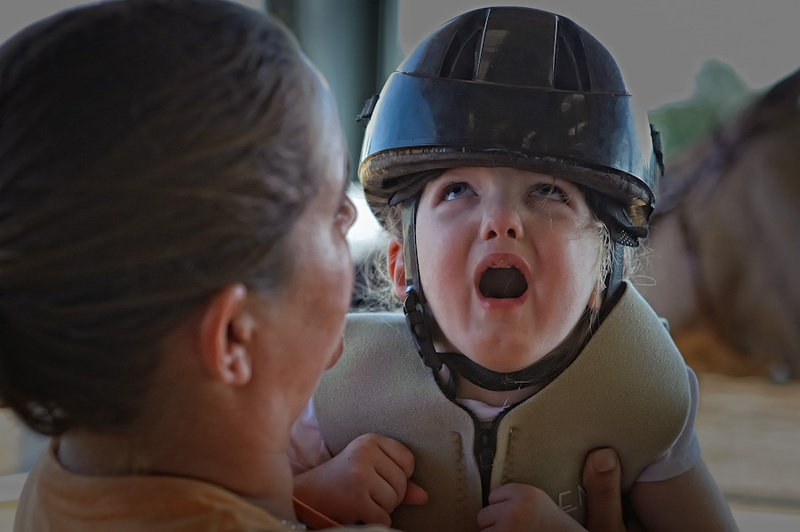 Your pictures brought back memories of pictures I took at our foster daughters first hippotherapy session, especially the deep excitement behind all of the apprehempsion that is in Claires eyes! I wish I could attach a recent picture her Mom sent of her atop a horse! The apprhempsion is completely gone and there is pure joy because it is no longer therapy, but now something she loves to do. And something she is SO suceessful at!!! As I continue to pray for Claire I will pray her in that direction. Right now everything seems so tedious, hard, and exhausting, but in time…keep up the good race and remeber HIS promises! The new therapy schedule sounds like it suits Claire and the family. Driving to/fro is not the best use of such precious minutes in the long run. Sounds like your home regime is best suited for her at this time! Way to recognize that and speak your needs. I love the new photos. Can’t wait to hear how the next few weeks of horseback riding go! Keep strong in your faith! I love reading your updates. Fabulous photos! Calire looks great. I’m so glad Autumn is enjoying school and that Heidi likes it better now than she did the first day. What a wonderful time for all your girls with so many brand-new and terrific things to see and explore! And for you and Tiffany who are sharing so much with them. Yay Claire – riding a gigantic horse with an ‘unweildy’ helmet! Sounds like you are doing the best therapy you can for her and both parents, too. Congrats to Heidi and Autumn for completing first week of school – they are great kids. Interesting and fun form of therapy! We’re so proud of Claire…she is amazing working so hard at holding up her head And I’m so happy to hear that Heidi is slowly adjusting to school. What a family of fighters :). Love you all! She is sooo cute! Ya’ll are being such wonderful parents! After seeing Claire last week at your house, I was surprised but pleased that she could get up on that horse. That’s a good sign of some progress. I promise my continued prayers. We loved the day along w u; the pics were great!! Kudos to Claire for a job well done! She looked happy. Thank you for sharing. Special shout out to Autumn, who visited out office last week on her first day of school. It was good to her and her mama. 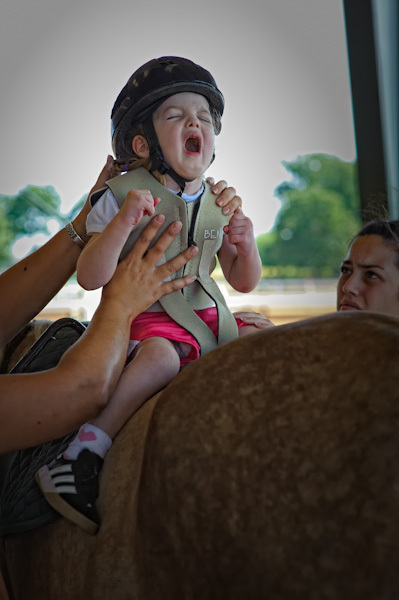 Great photo captures of Claire’s first hippotherapy session! Can’t wait to see how that progresses. We have been traveling from GA, to IA, to pick up our furniture from storage here in IA, and have it moved to our new home in GA; so I haven’t been online since we left GA.
We are so glad to receive this update on Claire; and we will continue to pray for the Lords’ complete healing for Claire. Thank you for keeping us udated on how she is doing. Thanks for allowing God to reveal Himself to me thru you! Our faith is not in what we see, but in the unseen. Jesus says fear not, because He will never leave us nor forsake us or your precious Claire! Truth can potentially make us miserable first, but according to Jesus, it will set us free. Jesus continues to teach that our lives are not about pursuit of the pot of gold under the rainbow, because we already possess it, although it is yet unseen. We have received a Spirit that makes us God’s children, heirs of God and not a slave again to fear. Our’s, today, is a Spirit of sonship as we are lead by the Spirit of God. We cry “Abba, Father!” because we have access by faith into grace in which we now stand. Jesus warned that in this world we will have trouble. Paul reminded us we will share in the sufferings of Jesus, but we will eventually share in His glory. Just as Jesus was raised from the dead through the glory of the Father, we too will live a new life. Again, we already possess, by faith and not by sight, the pot of gold under the rainbow. Yet Jesus wants us to learn how to dance in the rain. Not to only rejoice in the hope of the glory of God, but to rejoice in our sufferings. The rain is accomplishing unseen good, meaningful, loving, and purposeful consequences. So many of God’s people around me are living lives which are encompassing scenes of incomprehensible, horrific, pain. Romans 5 tells us, “You see, at just the right time, when we were powerless…God demonstrates His own love for us.” He knows we are powerless, yet loves us. Seeing Claire on top of that beast of burden allows me to dance in the rain. A photo of big sister holding up a book for her baby sister caused an Emmaus experience as I noted my heart burnning. Tyler, hearing your deepest feelings and thoughts enables me to dance in the rain, because, I am a privileged witness, in real life, to what it means to share in the sufferings of my Jesus. I bow once again to Jesus today, acknowledging our powerlessness in the face of significant confusion and pain, and ask Him to give us all, the eyes to see and the ears to hear our Unseen God and Father. I beckon His strength for your family, to continue to grasp hope in Him alone. A summons of health and healing for your 3 wonderful girls! Praise to God for revealing Himself to me, through you, this summer. You may not notice, however, I assure you Jesus is shining His pure light through your entire family into the dark places in this temporary world. We are humbled by your lives! Good-Weekend to you all! I loved the pictures. I have heard that this type of therapy is very beneficial. We continue to pray for your family daily. Thank you for sharing. Wow. 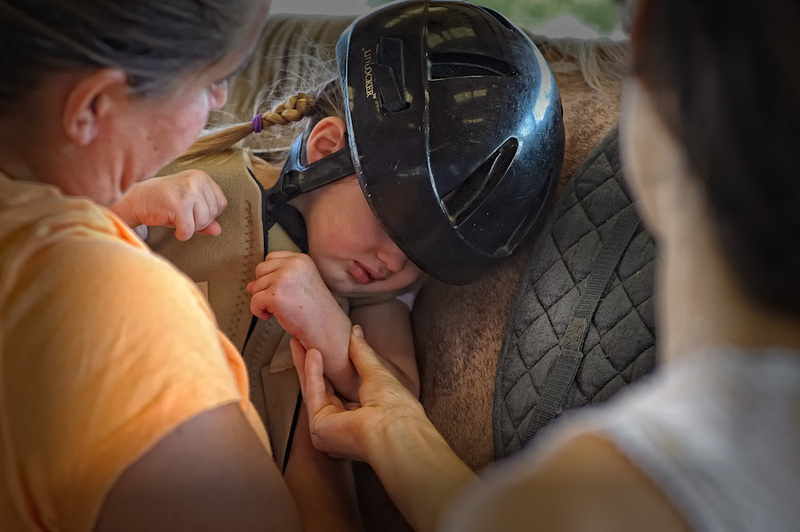 The power of Equine Therapy is remarkable. I am so glad that was suggested. God Bless you all and Stay Strong. You can see that Claire is in there!!! and thanks so much for sharing your daily triumphs and trials. Remember Philippians 4:13, I can do all things through Christ Who Strengthens me. God is continuously strengthening your whole family. Let Him Lead You. She looks awesome! These pictures bring back memories – I’m glad Claire can take advantage of another therapeutic avenue. I love you guys so much! I’ll call again soon, when my life stabilizes a little bit, ha! Love, love, love you! beautiful pictures… awesome progress. continuing to pray without ceasing. I hope that therapy with horses brings wonderful results for Claire. I keep praying for you all and thinking of you dialy. I am greatly encouraged with the start of this hippotherapy! Awesome job Claire Bear!!!! I’m also glad the girls had a good week in school and hope the family continues to do well. Thinking of you in CT!! Claire’s response to requests to raise her head filled me with the most overwhelming feeling of excitement and happiness! I hope you are greatly encouraged by this too. I admire you and Tiffany for all you are doing to rehabilitate Claire. I don’t see how you could do any more. You’re WONDERFUL parents! I continue to pray for ALL of you daily.